That’s how Suze has ended up at the graves of a pair of NCDPs - Non-Compliant Deceased Persons – whose drama didn’t end with death. It’s Suze’s job to make sure they move on—for good. Oh how I have missed this series! I know I reread it a few weeks ago, and I'm really glad that I did, but this new addition just made me all the more happy. Being only 128 pages, Proposal is short but a lot of fun. I love getting a preview of Suze's life since we last left her in Twilight. We get updates on what her family, friends, Father Dom, and she and Jesse have been up to. Some facts I found surprising and some facts I nodded along with thinking, "Well that makes sense." Suze is still mediating and as sarcastic and snarky as ever. She and Jesse have an adorable relationship and I found it endearing the Jesse is still hanging on to some of his older ways and traditions - much to Suze's dismay. 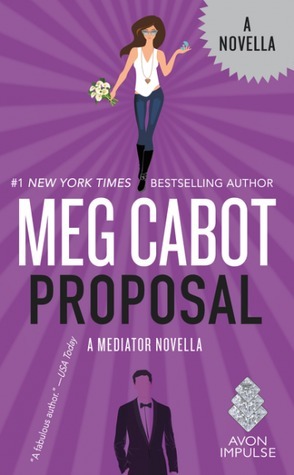 Proposal is the perfect introduction to Remembrance and (reintroduction?) to Suze and Jesse. Even if you're not a fan of short stories, you're definitely going to want to read this novel. Plus, the proposal itself is beyond grin worthy.